Devoted to an extensive range of research fields within the domain of nuclear science, the open access, peer-reviewed Nuclear Energy and Technology (NUCET) journal moves to the journal publishing platform ARPHA, developed by Pensoft, in order to provide a whole set of novel technological advancements to its users: readers, authors and editors alike. 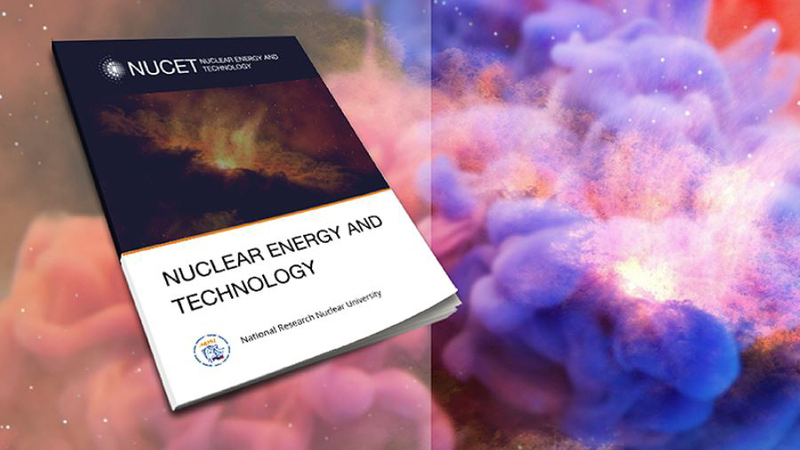 The first journal issue since the transition is now live on NUCET‘s new website and features a total of 12 research articles, covering topics including nuclear power plant operation, reactor physics and thermal hydraulics. Launched in September 2015 by the internationally recognised National Research Nuclear University MEPhI (Moscow Engineering Physics Institute), the journal has since been providing an open-access, peer-reviewed English-language outlet for original research, ideas and developments for scientists from around the globe. The journal is managed by the Institute of Nuclear Physics and Technology of the National Research Nuclear University MEPhI. Nuclear policy, economics and education issues. 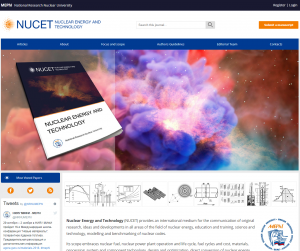 Homepage of the new website of the Nuclear Energy and Technology (NUCET) journal. Beyond the sleek new website, ARPHA platform provides various high-tech perks to ensure that the entire publishing process – beginning with manuscript submission and continuing all the way to the dissemination, archiving and indexing of the article’s content and metadata – takes place within its single online environment. With each article being simultaneously published in semantically-enriched PDF, HTML and XML formats, the publications are easy to discover, access and harvest by both researchers and computers. As a result, research published in NUCET is easier to cite, reuse, build on and replicate. 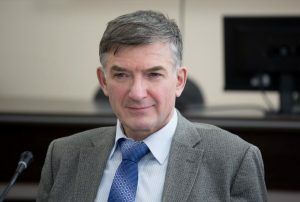 “Today we are celebrating an important event – the first issue of the journal Nuclear Energy and Technology on the ARPHA platform.” As the Rector of the National Research Nuclear University MEPhI and NUCET’s Editor-in-Chief Prof. Mikhail Strikhanov says: “NUCET is an English-language periodical of the MEPhI that is promoting the results of our research to the worldwide scientific community”. “We have analyzed many publishing platforms and explored their strengths and weaknesses. ARPHA publishes many high-quality journals, and it is very important for us to be the first in the field of nuclear physics there. We are looking forward to continuing cooperation with Pensoft, and we are confident that with the help of ARPHA NUCET has an incredible future and the quality of its materials will be at a high level”. Nuclear Energy and Technology (NUCET) is the fifth Russian journal to move to ARPHA Platform, following Comparative Cytogenetics, Research results in Pharmacology, Russian Journal of Economics and Arctic Environmental Research. Follow Nuclear Energy and Technology (NUCET) journal on Twitter. The National Research Nuclear University MEPhI is a leading Russian university and a research and educational centre with honourable traditions and clear vision of the future. It empowers the world’s best nuclear technological experts and talented students to produce secure and stable energy, excel in creating applicable science, boost human capital and economic output in various fields, support industry and business and be innovative and creative. MEPhI is proud of its ambitious and skilled experts in science and engineering who have graduated at the university since its establishment in 1942, including six Nobel laureates, who have themselves later contributed to the educational process and research activities at the institute. Social Psychological Bulletin (SPB), formerly known as the Polish-born Psychologia Spo?eczna, has rebranded and evolved to reflect its new international outlook and dedication to social psychological research and open science practices. In line with its renowned legacy, the peer-reviewed journal welcomes original empirical research, theoretical review papers, scientific debates, and methodological contributions in the field of basic and applied social psychology. However, from now on, accepted articles are to be exclusively in English and openly accessible from day one of publication. Furthermore, authors are able to publish with SPB free of charge in the name of socially committed and responsible research. The journal places special emphasis on what its Editors-in-Chief Drs Michal Parzuchowski and Marcin Bukowski call “the updated FOCI” – an abbreviation for Focused on people, Open, Committed and Integrative. The changes meant to lead up to the journal’s long-term progress, also outlined in the latest Editorial, come as a result of SPB joining two prime movers in the open science field – the Leibniz Institute for Psychology Information (ZPID) with its unique publication platform, PsychOpen GOLD, and Pensoft with its innovative journal publishing and management system, ARPHA. 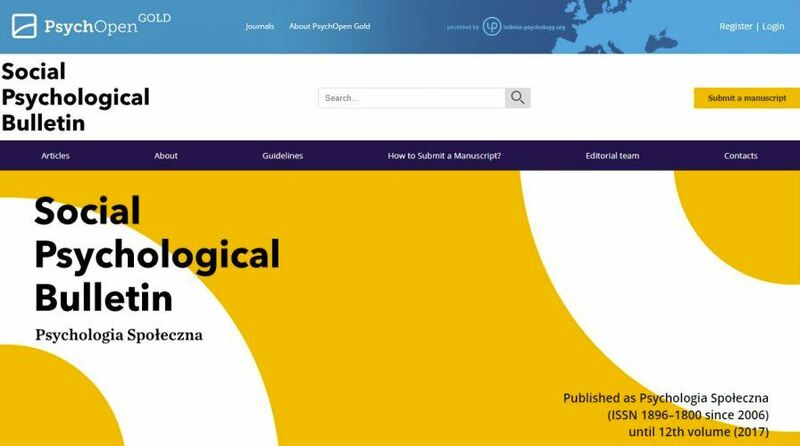 Since 2012, PsychOpen GOLD – The European Open Access Publishing Platform for Psychology – allows for both journals and authors to increase the visibility and accessibility of novel psychological research in the spirit of open science practices free of charge. In the new pilot project, ZPID’s PsychOpen GOLD also collaborates with the technologically advanced academic journal and book publishing platform ARPHA in order to further facilitate and increase visibility of the novel findings of societal value. 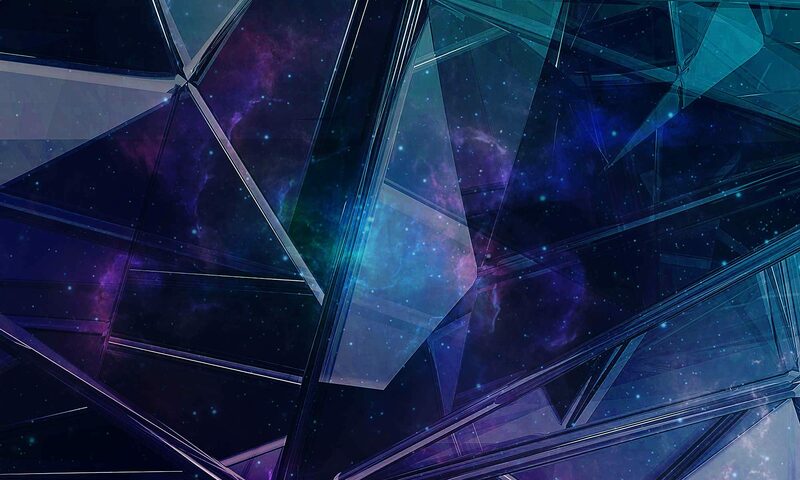 As a result of the partnership, SPB will make use of the long list of high-tech and user-friendly innovations, provided by ARPHA, which go far beyond the brand new sleek look and feel of the journal. The journal’s first thematic issue comprises 10 forum papers (by Dariusz Doli?ski, Arie Kruglanski, Adam Factor & Katarzyna Jasko; Leonel Garcia-Marques & Mario Ferreira; Wolfgang Stroebe; Karl Halvor Teigen; Jolanda Jetten & Alexander S. Haslam; Miros?aw Kofta; Bogdan Wojciszke & Konrad Bocian; and Klaus Fiedler) dedicated to discussions on behavior and its measurement as triggered by Prof. Dariusz Dolinski’s article “Is Psychology Still a Science of Behaviour?”. In his paper, Dolinski calculates that the number of articles in a recent volume of the flagship Journal of Personality and Social Psychology (2017) presenting studies in which the dependent variable consisted of a real behavior was 4 out of 49 (8.2%). Out of a total number of 290 studies presented in this volume, a mere 18 (6,2%) addressed behaviour. He argues that in addition to studying phenomena like stereotypes, attitudes, and values – which he dubs the “what, how, and why people think”, social psychology needs to also remain dedicated to the “what, why and how people act”, i.e. things such as aggression, altruism, and social influence. Follow the discussion in the second 2018 issue of Social Psychological Bulletin on the journal’s new website. Follow SPB on Twitter and Facebook. Formerly known as Bulletin of the Pomor University and Bulletin of the Northern (Arctic) Federal University, the open-access peer-reviewed journal published by Russia’s Northern (Arctic) Federal University (NArFU) recently changed its name to Arctic Environmental Research (AER) to accentuate its international relevance. Now, it also accommodates a whole set of novelties and innovations as a result of its move to the journal platform ARPHA. Its first issue in collaboration with the revolutionary publishing solution, developed by scholarly publisher and technology provider Pensoft, is already live on the journal’s new website. Launched in 2012, AER continues to provide a scholarly venue for publication of research findings related to the Arctic and adjacent areas, in order to draw attention to the most relevant, promising and interesting findings from the region, and facilitate exchange of scientific information on an international level. 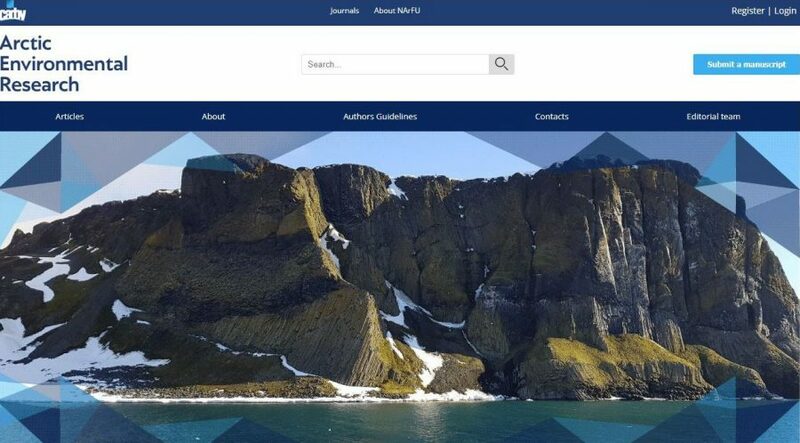 Traditionally, the journal covers a wide range of disciplines, including geology, geodesy and cartography, geoinformatics, geoecology, engineering geology, permafrost and soil science, prospecting and exploration of solid minerals, oil and gas fields, biogeography, botany, microbiology, zoology, genetics, ecology, hydrobiology, parasitology, mycology, soil science, biological resources. Its focus is placed on original research based on field or laboratory experiments and mathematical modeling of processes taking place in high latitudes. Thanks to its collaboration with ARPHA platform, the journal has already implemented a long list of high-tech perks in addition to its brand new sleek and modern look and feel. To the benefit of authors, reviewers, editors and readers alike, the fast-track and convenient publishing workflow provided by ARPHA takes care for each manuscript all the way from submission and reviewing to dissemination and archiving without ever leaving the platform’s singular collaboration-friendly online environment. Once published, all articles in AER are to be available in three formats (PDF, XML, HTML), enriched with a whole set of semantic enhancements, so that the articles are easy to discover, access and harvest by both humans and machines. Amongst the high-tech widgets at disposal to anyone who accesses an article in the revamped journal are the article-level metrics available thanks to the partnership between ARPHA and the revolutionary discovery and analytics tools Dimensions and Altmetric. By searching through millions of research articles, grant applications, clinical trials, as well as policy documents, news stories, blogs and social media posts, they allow for each article’s references and citations in both the academic and the public sphere to be monitored in real time. “I am truly delighted to welcome Arctic Environmental Research to ARPHA’s family,” says ARPHA’s and Pensoft’s founder and CEO Prof. Lyubomir Penev. “Being proven pioneers on the scholarly publishing scene in addition to our strong presence in environmental science, at ARPHA we believe that our white-label publishing solution makes a perfect match for forward-thinking institutions such as the NArFU and AER. AER is the fourth Russian journal to find its new publishing home with ARPHA Platform after Comparative Cytogenetics, Research results in Pharmacology and Russian Journal of Economics. Several new titles are expected to join them later this year. Russian Journal of Economics (RuJE) is the latest competent and renowned journal to join the ranks of the open access titles published on the next-generation platform ARPHA, developed by scholarly publisher and technology provider Pensoft. The journal’s 2018 inaugural issue and the first since the realization of the new partnership is already live on the journal’s new website. The articles are brought together under the theme “The Austrian School of Economics: Its Reception in European Countries” and have been briefly presented at the Second World Congress of Comparative Economics “1917-2017: Revolution and Evolution in Economic Development” held in St. Petersburg, Russia, in 2017. Having taken advantage of the white-label publishing solution offered by ARPHA, the open access peer-reviewed journal is to continue being recognized as one of the titles founded and published by the reputed institutions of National Research University Higher School of Economics, Russian Presidential Academy of National Economy and Public Administration, Gaidar Institute for Economic Policy, and non-profit partnership Voprosy Ekonomiki. Although recently established, the journal is well-known among its audience comprising primarily professional economists working in academia, government and private sector. Since its launch in 2015, RuJE has been providing a scholarly outlet for research findings in all fields of economics related to policy issues and is being published on a quarterly basis. While the journal focuses on the Russian economy, economic policy and institutional reform with a broader international context and sound theoretical background, it also welcomes submissions in all areas of applied and theoretical economics, especially those with policy implications. “The task of the project is to create a competent international information resource for academic economists, expert and business communities, devoted to macroeconomic policies in different national contexts, including the Russian one, institutional issues and comparative analysis. The high technological base of ARPHA platform gives all the necessary opportunities to realize the strategic goals of Russian Journal of Economics,” says Andrey Kotkovsky, Director at NP Voprosy Ekonomiki. What does ARPHA bring to the table? As a result of its transition to ARPHA, not only does the journal look a lot different on the outside, but it also provides a whole range of high-tech innovations beneath the surface. Among these is the prominent fast-track and convenient publishing workflow provided by the platform. It allows for each manuscript to proceed all the way from submission and reviewing to dissemination and archiving without ever leaving the platform’s singular collaboration-friendly online environment. Once published, all articles are to be available in three formats (PDF, XML, HTML), enriched with semantic enhancements, so that they are easy to discover, access and harvest by both humans and machines. To further enhance discoverability and reusability of the findings published in the journal, its content is to be indexed by major interdisciplinary services CrossRef and DOAJ in addition to the economics-specialized database RePEc. RuJE’s articles are also to be archived in CLOCKSS and Zenodo, in accordance to ARPHA’s standard practices. What’s on in the new issue? In the opening article by Dr Gilles Campagnolo, Aix-Marseilles School of Economics, the reader is given a complex overview of the reception of the Austrian ideas in France, while also covering valuable information about the development of the Austrian School of Economics itself. The publication highlights the fact that these ideas increased their popularity in the country following the Russian perestroyka and the?fall of the Berlin Wall. The topic is carried on into another two articles dealing with the history of this process in Russia (Soviet Union) and Bulgaria. The team of Prof. Vladimir Avtonomov and Prof. Natalia Makasheva, National Research University Higher School of Economics, Russia, and the one of Prof. Nikolay Nenovsky, University of Picardie Jules Verne, France, and Dr. Pencho Penchev, University of National and World Economy, Bulgaria, both identify three principal periods – initial reception, complete oblivion during the communist regimes, and renaissance in post-communist times. The Italian perspective on the Austrian economic ideas are given in an article authored by Prof. Antonio Magliulo, University of International Studies of Rome. He explores two periods – before World War II, as linked with Menger’s influence – and compares it with Hayek’s. The editorial by Prof. Vladimir Avtonomov looks back on the so-called Marginal revolution in economics from the 1870s. Thus, the reader obtains a firm grasp on the origins of the three European schools of economics with a focus on the Austrian one, before tracing the economic environment on the Old Continent well into the 20th century through the pages of the journal’s special issue. Russian Journal of Economics is the third Russian title to find its new publishing home with ARPHA Platform after Comparative Cytogenetics and Research Results in Pharmacology. Several new titles are expected to join them later this year. Since 2015, Belgorod National Research University‘s forward-thinking open-access and peer-reviewed scholarly journal Research Result: Pharmacology and Clinical Pharmacology has been filling an essential gap as a scholarly venue for publications dealing with long-year research outcomes in pharmacology and clinical pharmacology. Now, having moved to the high-tech journal publishing platform ARPHA (abbreviation standing for Authoring, Reviewing, Publishing, Hosting and Archiving), the rebranded Research Results in Pharmacology demonstrates its refreshed format in its first issue jointly published with open-access scholarly publisher and technology provider Pensoft via the journal’s brand new website. Continuing its tradition, the journal welcomes articles on various aspects within pharmacology, including papers devoted to molecular screening with the use of modern methods of proteomics, cellular technologies, results of experimental studies in modeling abnormalities in laboratory animals and clinical studies in the field of pharmacotherapy, pharmacokinetics, pharmacoepidemiology, personalised therapy, multicenter studies and evidence-based medicine. All articles are published in English, with versions in Russian published on Belgorod National Research University’s official website. 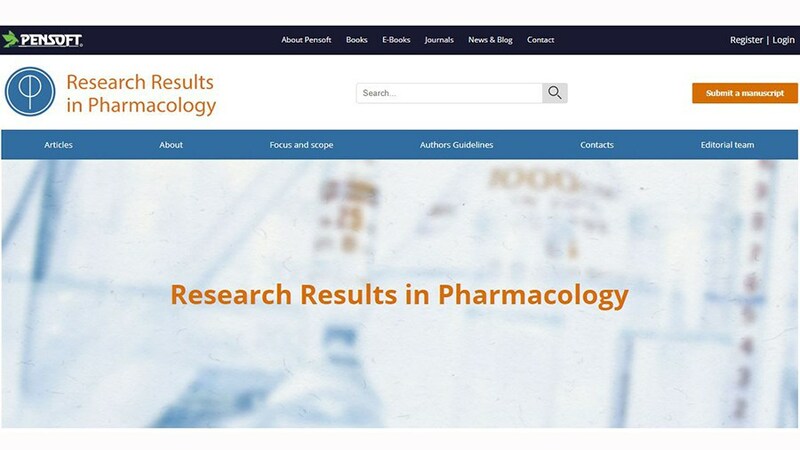 Apart from the evolution in its look-and-feel, thanks to the partnership with ARPHA, Research Results in Pharmacology now provides a long list of services at the disposal of all users – editors, reviewers, authors and readers alike, in order to ensure that articles are submitted, reviewed, published and disseminated rapidly and conveniently. To do this, the whole publication process takes place within ARPHA’s singular online environment. Once published, each article is freely available in three formats (PDF, XML, HTML), enriched with a whole set of semantic enhancements, so that the articles, along with their data, are easy to discover, access and harvest by both humans and machines. Amongst the high-tech perks greeting any online publication’s visitor are the article-level metrics available thanks to the partnership between ARPHA and the revolutionary discovery and analytics tools Dimensions and Altmetric. By searching through millions of research articles, grant applications, clinical trials, as well as policy documents, news stories, blogs and social media posts, they allow for each article’s references and citations in both the academic and the public sphere to be monitored in real time. Research Results in Pharmacology is the second Russian journal in ARPHA’s and Pensoft’s portfolios. Several new titles are expected to join them later this year. Follow Research Results in Pharmacology on Twitter and Facebook. Evolutionary Systematics is the latest authoritative journal to join the lines of the open access titles published on the Pensoft-developed technologically advanced journal publishing platform ARPHA. Launched in 1884 and 1912, respectively, University of Hamburg’s journal Mitteilungen aus dem Hamburgischen Zoologischen Museum und Institut and Entomologische Mitteilungen are now resurrected under the name of Evolutionary Systematics. Rebranded and refreshed, the journal has acquired a long list of technological user-friendly innovations, while simultaneously keeping its well-known expertise and devotion to whole-organism biology and collection-related research. Its first issue in collaboration with Pensoft comprises two editorials dedicated to the extensive tradition and the bright future of the journal along with seven articles are already live on the journal’s new website. Right underneath the new sleek look and feel welcoming users from the journal’s homepage, there are a lot of high-tech perks to benefit authors, readers, reviewers and editors alike. Thanks to the fast-track and convenient publishing provided by ARPHA, each manuscript is carried through all stages from submission and reviewing to dissemination and archiving without ever leaving the platform’s singular collaboration-friendly online environment. Furthermore, all publications are available in three formats (PDF, XML, HTML), complete with a whole set of semantic enhancements, so that the articles are easy to find, accessed and harvested by both humans and machines. 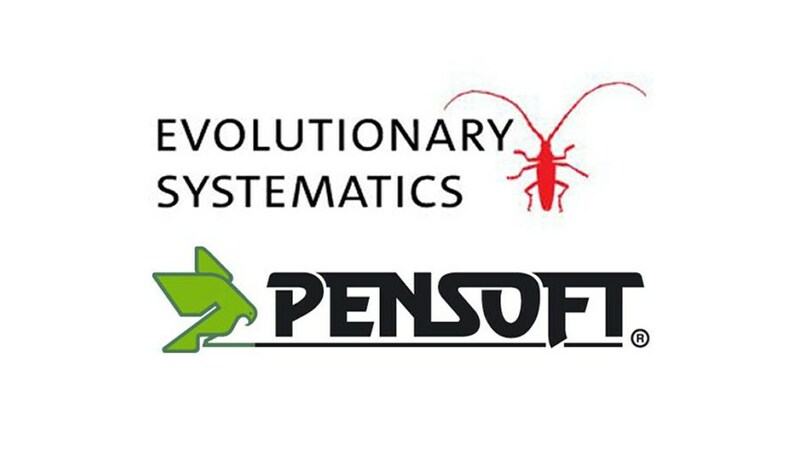 “We are happy to have joined forces with Lyubomir Penev and his professional team at Pensoft Publishers, once again now after having already successfully established together Zoosystematics and Evolution as an international journal of the Berlin Natural History Museum,” say editors Prof. Dr. Matthias Glaubrecht, Prof. Dr. Andreas Schmidt-Rhaesa and Dr. Martin Husemann. Amongst the first papers, there is the description of the Bob Marley’s Intertidal Spider – a new arachnid species that emerged at low tide to the surprise of the research team of Drs. Barbara Baehr, Robert Raven and Danilo Harms. Once the scientists concluded it was a previously unknown species, they were quick to associate it with the reggae legend’s song “High Tide or Low Tide”. The first issue also features the description of the Grey Wolf Spider – a common, yet enigmatic new species, which prompted the establishment of a new genus all to itself. The inaugural issue goes on to also announce as many as seven species of goblin spiders new to science . Their discovery results from a genus review involving a significant collection from the Otonga Nature Reserve, Ecuador. Follow Evolutionary Systematics on Twitter | Facebook. Pensoft is an independent academic publishing company, well-known worldwide for its innovations in the field of semantic publishing, as well as for its cutting-edge publishing tools and workflows. In 2013, Pensoft launched the first ever end to end XML-based authoring, reviewing and publishing workflow, as demonstrated by the Pensoft Writing Tool (PWT) and the Biodiversity Data Journal (BDJ), now upgraded to the ARPHA Publishing Platform. Flagship titles include: Research Ideas and Outcomes (RIO), One Ecosystem, ZooKeys, Biodiversity Data Journal, PhytoKeys, MycoKeys, and more. Launched about a century and a half ago, the Swiss Entomological Society‘s official journal Die Mitteilungen der Schweizerischen Entomologischen Gesellschaft (Journal of the Swiss Entomological Society) is the latest historical scientific journal to join the lines of Pensoft’s portfolio. As a result of an unanimous vote at the Swiss Entomological Society’s general assembly in March, the journal is now rebranded as Alpine Entomology to reflect the shift in its scope and focus. Furthermore, the renowned journal is also changing its format, submission and review process, “in accordance with the standards of modern scientific publishing”, as explained in the inaugural Editorial. 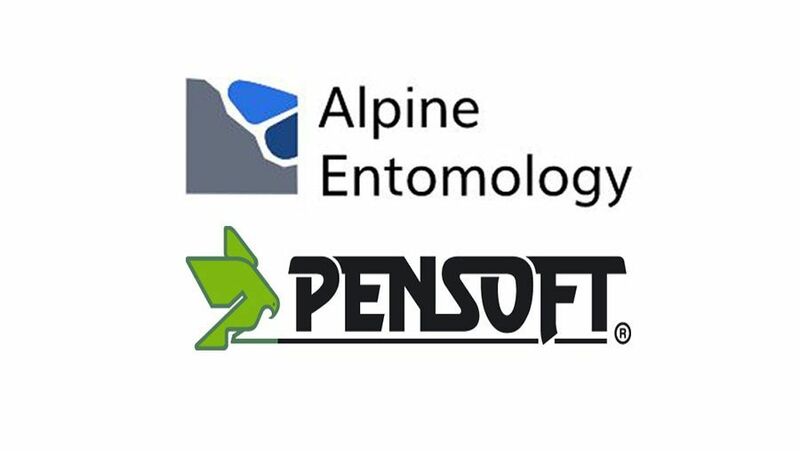 The first articles of Alpine Entomology in partnership with Pensoft are already live on the journal’s new website. “Focusing the scope will improve the quality of the journal and of the submitted papers and therefore increase the impact in the scientific community,” say Dr. Thibault Lachat, Bern University of Applied Sciences and Swiss Federal Institute for Forest, Snow and Landscape Research, and Hannes Baur, Natural History Museum of Bern, and University of Bern. Alpine Entomology now accommodates a long list of high-tech perks and brand new looks thanks to the innovative journal publishing platform ARPHA – the Pensoft-developed innovative journal publishing platform. Nonetheless, the journal preserves its well-respected expertise and dedication to original research on the insect fauna. Occasionally, it will be also publishing studies on other arthropods from the Alpine region or other mountainous regions all over the world. Apart from the all-new look and feel visible at first glance, there are many technologically-advanced innovations to benefit authors, readers, reviewers and editors alike. Once published, all articles in Alpine Entomology are to be available in three formats (PDF, XML, HTML), enriched with a whole set of semantic enhancements, so that the articles are easy to discover, access and harvest by both humans and machines. Amongst the first papers, there are descriptions of several new mountainous species from around the world that have remained unknown to science until very recently. Two separate papers describe two new species of long-legged flies from Turkey and Croatia, respectively; while a third one reports a new ground beetle dwelling in Bhutan’s Thrumshingla National Park. “I’m delighted to welcome this particular new member of the Pensoft’s and ARPHA’s family,” says the publisher’s founder and CEO Prof. Lyubomir Penev. “With our own solid experience in both scholarly publishing and entomological research, I’m certain that we’ll be able to provide the right venue for a fantastic title as Alpine Entomology. Follow Alpine Entomology on Twitter | Facebook. Issued via ARPHA – the first ever publishing platform to support manuscripts all the way from authoring to peer review to publication and dissemination, designed by the academic publisher and technology provider Pensoft, the new journal is to host a wide range of outcomes from across the research cycle, including data, models, methods, workflows, software, perspectives, opinions, implementation strategies, as well as conventional research articles. While the above-mentioned publication types are already available in other journals published on the ARPHA platform, such as Research Ideas and Outcomes (RIO), Biodiversity Data Journal and One Ecosystem, MBMG provides five extra domain-specific article types, namely: Emerging Technique, Applied Study, DNA Barcode Release, Primer Validation and Probe Validation. The journal’s articles are to be available in three formats (PDF, XML, HTML) and full of semantic enhancements for better human- and machine-readability and discoverability. The XML-based workflow also ensures that content and data are available for extraction, indexing and re-use immediately after publication. “MBMG not only complements the range of journals in the field of molecular environmental life sciences, but also stands out as a novel outlet providing several unique features designed to help researchers to prepare for, and professionally deal with, the massive “deluge” of data,” reads the Editorial. The well-reputed and established journal Check List is the latest biodiversity-themed title to join scholarly publisher Pensoft’s peer-reviewed and open access family. Its first issue in collaboration with Pensoft is now published on the journal’s new website. Check List is an online open access journal launched in 2005 in Brazil. It publishes distribution summaries, annotated lists of species and notes on the geographic distribution of all taxa. The journal stands for the idea that maintaining records of the range of a species is the very first step towards undertaking effective actions for its conservation. Furthermore, its team believes that publishing such data provides the baseline for biodiversity preservation as a whole. The move sees Check List migrating to the Pensoft-developed journal publishing platform ARPHA (abbreviation for Authoring, Reviewing, Publishing, Hosting and Archiving) to provide its authors, editors and users with a brand new look and feel along with a whole set of high-tech perks. While the all-new sleek interface is evident at first visit of the Check List‘s new website, there is much more under the surface. The partnership with Pensoft and ARPHA means that Check List will enjoy fast-track and convenient publishing. The manuscripts will be taken care for from the authoring stage, through reviewing and dissemination – all the way to archiving. The papers will be published in three formats (PDF, XML, HTML) and full of semantic enhancements. Recognising the importance of easy and efficient publication of accessible data in the spirit of both biodiversity conservation and open science, ARPHA allows for data to be published as supplementary files along with the article, or through internationally recognised repositories, such as GBIF, Genbank, Barcode of Life, Dryad, and others. “It is fantastic to have Check List join the world’s leading and most technologically advanced biodiversity publisher,” comments Check List Editor-in-Chief Marcus Guidoti. 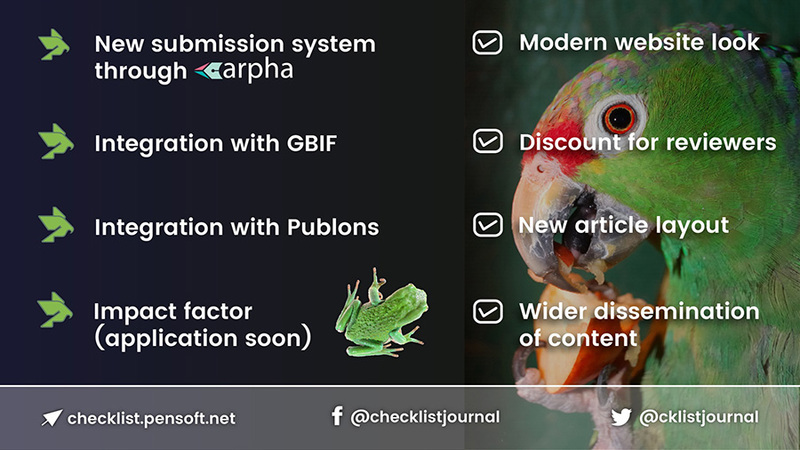 Check List is the second scholarly journal of South American origin to join Pensoft’s growing portfolio, after another highly regarded Brazilian-born academic title – Zoologia – moved to ARPHA earlier this year. The Orthopterists’ Society’s Journal of Orthoptera Research (JOR) joins the growing portfolio of open access titles published on the Pensoft-developed journal publishing platform ARPHA(abbreviation for Authoring, Reviewing, Publishing, Hosting and Archiving). The first issue in collaboration with Pensoft is live on the new journal’s website as of June 2017. 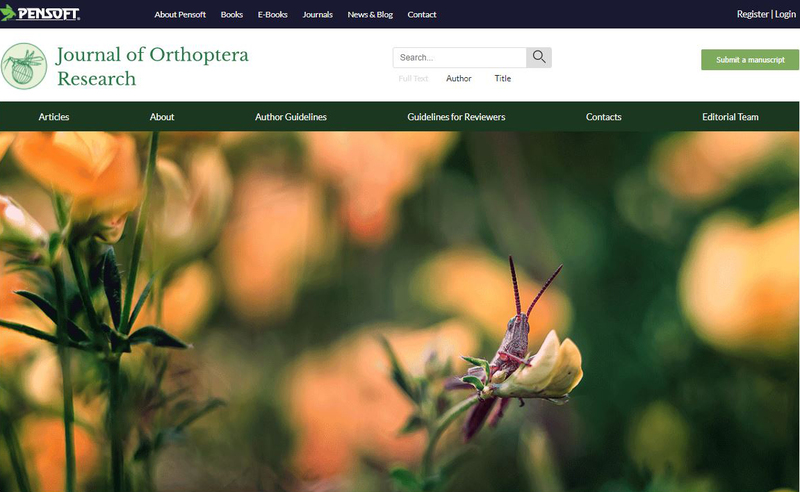 While preserving its attractive and well-known style and global expertise on the order Orthoptera and other closely allied insect orders, the journal now offers increased accessibility through a modernised design, intuitive interface, and many high-tech perks for authors, readers, reviewers and editors alike. In continuous publication since 1992, Journal of Orthoptera Research is no newcomer to the arena of entomological peer-reviewed journals. It has enjoyed an esteemed place in the canon as the only global scientific publication dedicated to publishing work on the grasshoppers, crickets and bushcrickets. Now, the move to Pensoft ushers the journal to a new digital age by providing a modernised platform for showcasing fascinating research on these most charismatic and valuable of insects. Among the innovative advantages is fast-track and convenient publishing thanks to ARPHA. Each manuscript is carried through all stages from submission and reviewing to dissemination and archiving on a single platform to facilitate and expedite the process using the best technological capabilities. Furthermore, this results in publications available in three formats (PDF, XML, HTML) with state-of-the-art semantic enhancements, so that articles can be easily found, accessed and harvested by both humans and machines. 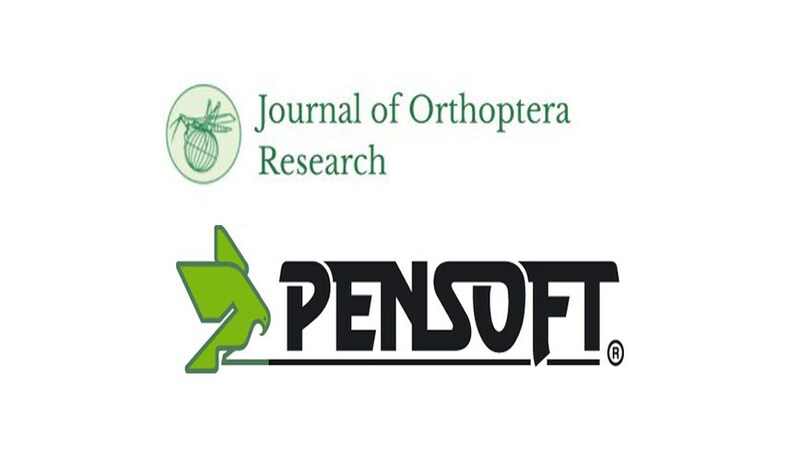 Among the nine articles comprising the first Journal of Orthoptera Research issue since joining Pensoft [JOR Vol. 26(1)], there is a new species of bushcricket from China that sings an unusually complex tune when courting its potential partners; a curious experiment in the colour-shifting abilities of adult grasshoppers; and a description of a unique YouTube video showing two male bushcrickets engaging in previously unreported sexual activities. “I’m certain that ARPHA will secure the right place for Journal of Orthoptera Researchamong a whole portfolio of excellent zoological journals. Our journal will definitely feel at home next to the names of Journal of Hymenoptera Research, Nota Lepidopterologica, Zoologia, ZooKeys and many others,” says Editor-in-Chief Dr. Corinna Bazelet. The journal will continue being released biannually. Traditionally, it publishes research on the insect order Orthoptera, as well as its close allies – Blattodea, Mantodea, Phasmatodea, Grylloblattodea, Mantophasmatodea and Dermaptera. The range of biological studies of these insects includes diversity, conservation, and control and management of pest species. As for the article types accepted in the journal, in addition to original research, editors will be considering review articles, short communications, and articles focusing on policy and management of Orthoptera. Follow Journal of Orthoptera Research on Twitter | Facebook.